Geopolitics manifests itself when strategic and commercial interests clash between two competing powers. But mutual economic interests can also have a balming effect on strained relations between two nations with historical animosities. Inter-dependence calls for hostilities to be moderated. Norman Angell wrote that globalization would lead to the end of war, but Alfred Mahan warned that commerce can deter war and also trigger conflicts. Economics can be overwhelmed by national security concerns and domestic political priorities when dissonance reaches a boiling point. In this strange interplay of geopolitics and economics, let’s trace the moves of India and China into the world’s last strategic frontier. The quest for energy security took India and China to the numbing chillness of the Arctic. On May 15 this year, the two Asian giants were made observers in the Arctic Council (AC), a milestone in strategic outreach that received scant media attention. Climate change induced melting of polar ice will open up new vistas for commercial exploitation of natural resources and trade via new shipping lanes, once considered inaccessible. But it remains to be seen how Russia and Canada will react to the application of the 1982 United Nations Convention on the Law Of the Sea (UNCLOS) to the Arctic, which both consider as their backyard. United States Geological Survey (USGS) estimates of 2008 suggest that 13% of the world’s untapped oil and 30% of natural gas reserves lie beneath the ice caps. As the ice recedes, shipping routes through the Bering Strait, an important passageway in the Northern Sea Route (NSR) will open up, shrinking the distance between Asia and Europe considerably. Due to the growing importance of the region, the AC admitted six new members, including India and China, as observers. The AC was founded in 1996 by eight countries that have territory above the Arctic Circle: the US, Canada, Russia, and the Nordic states (Finland, Denmark, Iceland, Sweden and Norway). It’s an inter-governmental forum that promotes co-operation on environmental issues and scientific research. Members co-ordinate responses to marine disasters and search and rescue operations. With the passage of time, the Council may move beyond these issues to address concerns related to militarization, mineral exploration, and shipping rights. In view of the animated interests in Arctic navigation, Russia set up the NSR administration in March to oversee shipping activities. Given the mounting pressure to secure energy resources, it is natural for India and China to gain a foothold in the region. Though the mineral resources belong to the Arctic states and observers do not have voting rights in the decision making process of the Council, they can participate in its meetings and remain informed of its policies. Even if India and China lack territorial contiguity with the polar region, healthy bilateral relations with the Council’s permanent members and participation in research programs will go a long way in gaining access to resources and transportation routes. But seasonal constraints, difficulty in navigation, high insurance costs, and poor infrastructure will impede the full economic potential of the NSR. China’s interests in the Arctic is driven by a host of factors like scientific research, natural resources, shorter and safer shipping lanes, fisheries, and geopolitical power. To collect data on climate change induced melting of polar ice, China established an Arctic Research Facility in 2004 at the Yellow River station in the Norwegian island of Spitsbergen. It has also set up the Shanghai based Polar Research Institute, which makes extrapolations on container traffic and trade. Beijing has sent its scientists on five research trips to the Arctic since 1999. In 2010, China’s ice breaker Xue Long (Snow Dragon) undertook a three month sea voyage to the Arctic to gather data on its changing ecology. 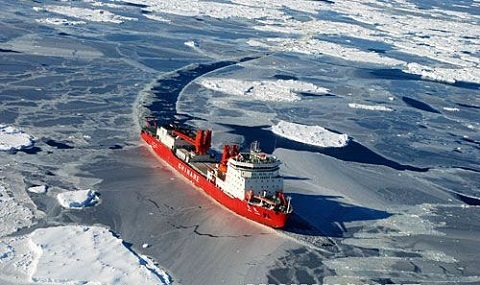 China plans to build another ice breaker and launch three expeditions to the Arctic by 2015. China imports nearly 60% of its energy products to fuel its economic growth. The Arctic is a natural destination for China’s energy needs. In November 2010, the Sovcomflot group of Russia and China National Petroleum Corporation (CNPC) signed a long-term agreement to ferry Chinese oil and gas supplies extracted from the Russian offshore fields. China is keen to explore mineral resources of Greenland, which is known to have substantial deposits of rare earths, uranium, iron ore, lead, zinc, and gemstones. There are also opportunities for the Chinese fishing industry to cash in on the new ‘fishing basket’ in the ice-free waters of the Arctic, given that China has a history of catching Krill in the Antarctic waters. China’s trade with the Arctic region has shown a 10-fold rise between 2001 and 2011. Chinese ship builders are also gearing up to build ice breaking vessels for both domestic and overseas markets. A navigable NSR traversing the Barents Sea and Russian territorial waters, rather than through the congested Mediterranean Sea and Suez Canal, drastically reduces the trip from Rotterdam to Shanghai. This cuts fuel and crew costs, apart from the safety in avoiding the piracy infested waters of the Malacca Strait and Gulf of Aden. Iceland has found in China a reliable partner. In 2008, China came to the rescue of Iceland’s economy when its banking sector was on the verge of collapse. No EU country had come to its aid. Since the Chinese bail out of its economy, Reykjavik is sympathetic to Beijing. China has recently entered into an Free Trade Agreement (FTA) with Iceland. Denmark is also supportive of China’s bid to obtain permanent membership in the AC on the basis of “its legitimate economic and scientific interests in the Arctic.” Though Greenland remains dependent on EU and Denmark for the bulk of its economic assistance, Nuuk is eyeing at investments from outside the Eurozone to shore up its sagging economy. It has granted mining licenses to Chinese firms to scout for mineral resources. But Chinese investments come with risks of flooding the host country with cheap labor and rapid environmental degradation. The other Nordic states are also mulling over the consequences of letting in China as a full member to the AC. India’s stated position is that it will contribute its scientific expertise, particularly the polar research capabilities, in advancing the goals of the AC. But beyond that, Delhi will look at options to explore for hydrocarbons and diversify its energy basket. Geography shows that Russia is best suited for exploration tie-ups. Half of the Arctic’s population is Russian. The area accounts for 11% of Russia’s GDP and over 20% of its exports. But to curry favor with Moscow, Delhi has to take a firm stand on the Russian contention that the disputed Lomonosov and Mendeleev ridges are extensions of its Siberian shelf. By toeing Moscow’s line, Delhi could get access to the rich mineral deposits and the NSR to ply trade. In a string of bids, Delhi has lost out to Beijing in the battle for Russian energy resources. India got a major jolt when CNPC signed an agreement with Novatek, Russia’s largest private gas producer, to acquire a 20% stake in an Liquefied Natural Gas (LNG) project in the Yamal peninsula in the Russian Arctic. Though India’s bilateral relations with the Nordic states are witnessing a spurt in trade and investments, the volumes are way behind that of China’s. India is yet to firm up a multi-pronged approach as that of China to engage with the Nordic states, especially in the area of strategic interests which will invariably become the cornerstone in Indo-Nordic relations. With Sweden, India has a checkered past in the area of defense and security co-operation. In the 1970’s, Delhi preferred the British Jaguar over Saab-Scania’s Viggen fighters. The Bofors gate erupted at a time when Indo-Swedish relations were at its prime with two visits to Delhi by Swedish Prime Minister Olof Palme. Saab’s Grippen fighters were dropped off the multi-vendor bid by India to acquire 126 medium multi-role combat aircrafts. And now it has emerged that a Swede, Jan Myrdal, was found to be giving tips to top Maoist leader Ganapathy last year in Chattisgarh for a big attack. The plan for the recent Darbha Valley ambush that wiped out the top State Congress leaders could well have been laid at that meeting. Indo-Norwegian strategic ties had also suffered setbacks during the years of the Liberation Tigers of Tamil Eelam (LTTE) insurgency. On the economic front, Oslo has deplored at Telenor’s investment failures in India. Incidentally, India’s Finance Minister recently paid a visit to Norway to iron out wrinkles in the bilateral relationship and further consolidate Delhi’s prospects in the Arctic. India is looking to woo Norway’s $700 billion sovereign wealth fund, apart from bagging stakes in the offshore oil fields dotting the Barents Sea recently opened up for development as per its New Exploration Licensing Policy. Though security issues did come up for discussion during the Finnish Foreign Minister’s recent visit to Delhi, the details of those talks remain under wraps. In Finland’s ‘Action Plan for India’, trade and investment forms the core of Helsinki’s vision document. Nehru’s visit to Copenhagen in 1957 laid the foundation of Indo-Danish relationship. But ties between the two sides became frosty in July 2012 when India scaled down diplomatic ties with Denmark after its refusal to extradite Kim Davy, the main accused in the 1995 Purulia arms drop case. During the Icelandic Foreign Minister’s visit to Delhi in 2011, his counterpart S. M. Krishna broached the issue of Indian strategic interests in the Arctic. But it remains unclear whether the Indian Prime Minister picked up the threads from where S. M. Krishna left, in his talks with Iceland’s President during his recent India visit. According to the Multilateral Investment Guarantee Agency’s 2009 survey of leading BRIC (Brazil, Russia, India, and China) “outward Investors”, Indian investors have been found to be more responsible and transparent than China in Africa, where several states are perceived to be “undemocratic” with weak regulations and lawlessness. According to the report, Indian firms engage with local stakeholders and are sensitive to local concerns. If India is seen as a more trustworthy partner in Africa than China, then surely the Nordic countries can expect the same from Indian businesses if crucial sectors are opened up for Indian investments. Closer economic integration and confidence building will pave the way for India’s full membership in the AC along with China.